Our consultations revealed strong support for a clean start through the establishment of an entirely new peak body, with a democratic constitution and member participation, forward-looking outlook reflecting a maturing industry, and representative across the organic supply chain. Particular attention must be given to representative mechanisms that support accountability of institutions. We considered numerous options for new industry peak body and we tested aspects of these options in our consultations. We are strongly of the view that the widest possible range of organic operators should determine the structure of the peak body, as this would be a powerful mechanism to promote democracy in the industry. However, we have no doubt that the best outcome would be best achieved if Australian Organic, NASAA and the Organic Federation of Australia can reject the failed past attempts at collaboration, settle their differences, and merge their advocacy functions to form a new peak body. This would send a powerful message to the whole industry and external stakeholders that the industry is jettisoning its fractious history and focusing on unity and the future. The current structure of organic industry bodies is a key factor in industry dysfunction. Critical accountability mechanisms are absent across existing advocacy bodies, and this contributes to the dysfunction. Our consultations revealed strong support for a clean start through the establishment of an entirely new peak body, with a democratic constitution and member participation, a forward-looking outlook reflecting a maturing industry, and representative across the organic supply chain. Reforming this structure and improving representative mechanisms are necessary preconditions to the industry uniting. Truly representational organisations are difficult to sustain in a nation as geographically dispersed as Australia. Particular attention must be given to representative mechanisms that support accountability of institutions. Annual general meetings are especially problematic, as they tend to involve a relatively small group of motivated participants who may not be adequately representative of the broader industry. Strong accountability mechanisms are critical, so the executive is clearly accountable to the membership for operational efficiency and its effectiveness in achieving strategic outcomes. There are, broadly, five elements of structure that need to be considered. What legal form should the peak body take? 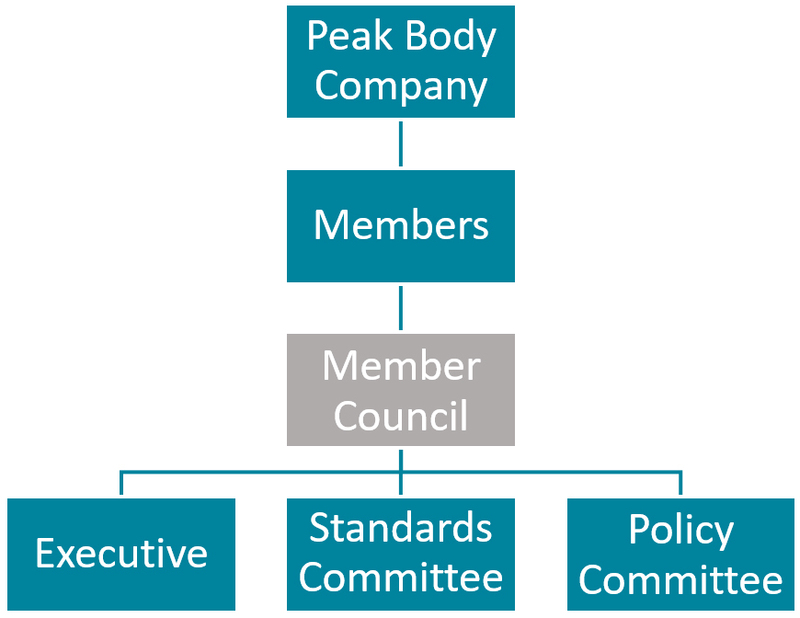 Who should be the members of the peak body and how are they organised? Is an executive required and how is it accountable? Where should organic standards be located and made accountable? What is the relationship of the peak body to the certifiers? Above all, it is necessary for a representative body to keep asking critical questions about who it is representing. In this case, it would something like, “how do we ensure we are truly representing the interests of producers, processors and traders”? Clear principles are needed to guide the design of structural options and to provide adequate assurances for those who need to sign up, or sign over, to the new entity. More detail on the principles we endorse for the organic industry in designing good governance to support high levels of performance is at Attachment D. The following is a summary of the key points for the organic industry. Poor governance can be fatal for organisations and its leaders. Good governance matters in terms of legality, credibility, probity and respectability of an organisation’s actions. Organisations must have a minimum set of bureaucratic processes in place to meet legal requirements and good corporate governance standards. But, while bureaucracy can assist an organisation avoid poor performance, too much bureaucracy can impede strong performance—there is a need to strike the right balance for any organisation’s unique operating environment. There was a low level of recognition that these two issues are inextricably linked and, therefore, it would not be fruitful to pursue improved market integrity without tackling improvements in regulatory arrangements. Our view is not so much “which functions” should be undertaken (we agree they all should), but rather what are the relative priorities and, over time, how these are determined and how much resourcing should be allocated and reallocated. These are matters of the governance processes and structures and the decision rules engendered by the constitution and procedures of the entity. We considered numerous options for a new industry peak body and we tested aspects of these options in our consultations. Our initial view was that revitalisation of the existing peak body was the logical and likely contender. OFA has been established for more than two decades, has a broad mandate and some existing structures in place, and has some successes in respect of market access, the development of AS6000, development of the national marque, its relationship with the International Federation of Organic Agriculture Movements, and its preparation of a bid to host the Organic World Conference in 2020. However, the OFA has struggled financially and has minimal existing capability—few assets, negligible intellectual property, no significant revenue stream, no staff, absence of strategic alliances with other sectors and RDCs, lack of democratic policy development—and our consultations revealed it has significant reputational problems and lacks support from key industry players. In fact, some of those consulted were categorical that the OFA would never garner broad industry support. This option would involve the demerger of the non-certifier functions and resources of Australian Organic and NASAA, and their merger with OFA to form a new peak body. Both NASAA and Australian Organic have been involved in delivering some of the functions proposed for the peak body. There is the prospect of one or both demerging their certification functions and merging their advocacy functions with the OFA to form a new peak body that is focused on representing the industry. The reconstitution required is major in order to permit an opening up to all parts of the industry, including other certifiers. In plain language, the newly constituted organisation could not be a closed shop or club, but would need to be open to all parties, including other certifiers, who have a legitimate claim to representation in the industry. This option would likely have broad support across the industry, provided the new body incorporated strong democratic processes and was open to all organic operators and certifiers. If done well, this option has the advantage of involving less operational and financial risk than a new peak body; however, it does involve some reputational risks and requires member support for the merger. This option is potentially useful as an interim measure prior to the full implementation of Option B. We envisage that Australian Organic, NASAA and OFA would form the nucleus of the joint venture in the first instance, but participation would be open to other entities as well—for example, larger operators and other certifiers. However, the joint venture would involve a new body corporate, and therefore doesn’t have any operational or establishment advantages compared with creating a completely new peak body. Nevertheless, this option could become very attractive if a temporary partner were to intervene to provide additional, temporary capability or seed funding—for example, a government, a large organic operator, or an RDC. This option emerged during the project and is being promoted by Australian Organic. It first requires the full de‑merger of Australian Organic Ltd (AOL) and its wholly owned subsidiary certifier operation, Australian Certified Organic Ltd. Being no longer a certifier, AOL would then emerge as the peak body. There are some advantages in this option. AOL asserts that it already has around 1,000 members, which is perhaps a third of organic operators. AOL has built up strong financial reserves through its certification operations. If these financial resources vest in AOL rather than ACO, this would provide significant seed funding for the new peak body. Establishment risks are minimised because of the strong starting balance sheet, but also because AOL would have existing corporate structure, staff, marketing, business processes, and so on. If the “bud logo” vests in AOL rather than ACO, then there is potential for the logo to replace the national marque and provide a strong source of licensing revenue to support the provision of peak body functions. It’s uncertain whether AOL members will support the demerger—particularly whether members will support the effective transfer of substantial financial assets from effective ownership by the certified operators (who contributed those assets), including the “bud logo”, to a peak body. The proposal does not currently promote improved representation across the industry (although any operator would be able to become a member of AOL—as they currently can). AOL has strong marketing capabilities, but has no particular expertise in policy development or advocacy—core capabilities for a peak body. It is possible that the existing corporate culture will undermine the development of effective policy and advocacy capabilities. AOL is based in Brisbane and, as the objective would be principally to influence national policies and stakeholders, normal practice would be for the peak body to be based in Canberra. Most importantly, the AOL proposal risks further divisiveness in the industry. Our consultations revealed some issues of trust in AOL across the industry and with external stakeholders, and particularly from organic operators aligned with certifiers other than ACO. This is largely a consequence of decades of AOL (via its predecessor, Biological Farmers of Australia) being a protagonist in the industry’s ‘squabbles’. This last point is crucial and is an interesting prism through which to view options A through D. Option B should be preferred of these options for one highly symbolic reason. If AOL, NASAA and OFA could reject the failed past attempts at collaboration, settle their differences, and merge their advocacy functions, then this would send a very powerful message to the whole industry and external stakeholders that the industry is jettisoning its fractious history and focussing on unity and the future. Our consultations revealed strong support for a clean start through the establishment of an entirely new body. Participants supported a democratic structure, with tiered membership fees reflective of the turnover of businesses, a Board renewal policy and a members’ advisory forum. The consultations revealed broad satisfaction with the corporate structure of the seafood industry’s new peak body (Attachment C). Perhaps the main reservation expressed about this option is that many organic operators consider that they already pay more in certification fees than they derive in benefit, and so any financial contribution to a new peak body would need to be offset by reductions in other fees—the industry development levies of AOL and NASAA are obvious considerations. A new peak body also involves establishment risks that aren’t as pronounced in some of the other options, but this is substantially outweighed by the absence of reputational risks compared with other options. Importantly, the establishment of a new peak body could be a very positive statement about focussing on the future, and it also becomes more viable if other options become untenable. It is critical that organic operators determine the structure of the peak body, as this would be a powerful mechanism to promote democracy in the industry. We propose that the industry should progress further consultations based on further development of the two most promising possibilities—Option D and Option E.
Notwithstanding the chosen peak body vehicle, a clear finding from the consultations was a strong desire for better forums to improve representation and discuss policy. There was support for a member advisory forum, along the lines of that adopted by the seafood industry, as an adjunct to the peak body. 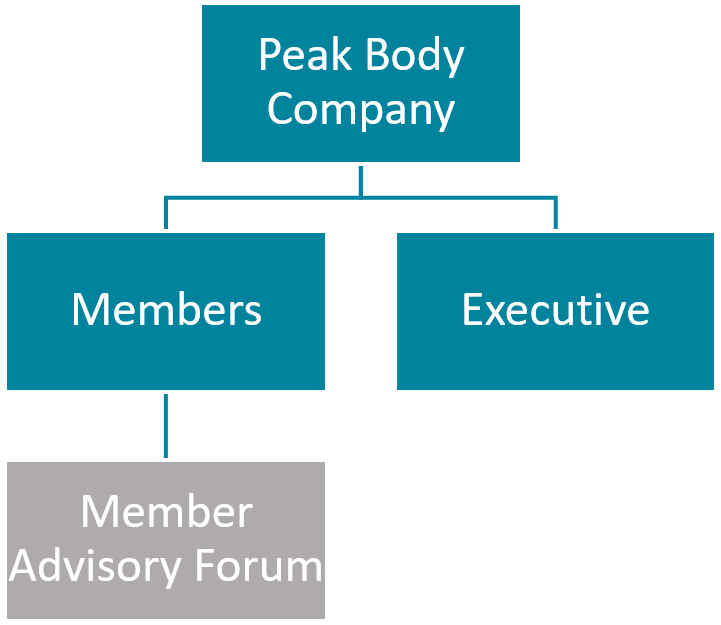 The relationship between the forum and the peak body will depend on the model chosen for a peak body, but it is envisaged that the forum would provide broad-based industry policy advice—for example, through the development of policy platforms—and the peak body would support the forum and operationalise the policy platforms. In the case of the seafood industry, a member advisory forum is open to all members and held annually, in conjunction with the annual general meeting. These forums provide an opportunity for members to voice their thoughts on key issues facing their individual sectors and the larger seafood industry. This advice and comment will assist the seafood peak body to prioritise its action plan and establishment of policies. The member advisory forum is convened the day prior to each board meeting, with the location of each board meeting rotating between capital cities. If conducted successfully, such a process may enable network members to develop a shared understanding of the policy problems in question, reach agreement on new and innovative solutions to policy problems, develop trust among network members, and assist members to learn about their interdependencies in pursuing their shared policy objectives. They would also become more informed advocates in the circles they move in and on social media, expanding the networks and influence. Note that this model is an adjunct to a traditional model of accountability. The executive is appointed at an annual general meeting and is held to account through that process. The member forum will be effective only as far as the executive adopts and implements the strategies developed. If accountability is weak, it is possible that the executive will pursue its own strategies, which may be different to that of the membership—in fact, this misalignment between executive direction and member expectations is a problem that plagues many agricultural peak bodies. A member council is a very different proposal to a member advisory forum. The purpose of a council would be to empower members more than would otherwise occur. The basic idea behind a member council is for the members to vest governance power in a large sub‑group of members that is more representative of the industry than could be achieved by simply appointing a Board. It also provides additional degrees of freedom to appoint outside specialists to the Board for operational objectives, without undermining industry representation. The main role of the member council would then be to set the strategic direction and hold to account those who implement that strategic direction. Critically, it would be the member council that appoints the executive (and can replace it at any time), and they would invest more resources in continuous monitoring than is typically achieved through a normal annual general meeting. We suggest that the member council would be appointed for a two-year period and that the proposed biennial conference (see below) would occur mid‑term and be one focus for the council’s attention. We have formed the view over the course of this project and through our consultations, that industry unity will be unlikely to coalesce unless a strongly representative forum, such as a member council, plays the preeminent role in enforcing accountability, setting strategic direction, developing policy platforms and resolving disputes (within the industry forums rather than in public). Many people told us that there were insufficient opportunities for organic operators to network, share experiences and debate issues. A biennial conference or industry summit would address this need. Given the geographic dispersion of organic operators and the resources required in organisation, an annual conference may be too burdensome on participants and organisers. However, a conference convened every two years, where significant effort is put into organisation and topics, would likely be popular among the membership. The conference should have activities held over two days (plus some additional options—like tours of farms or processing works) to make it worthwhile for those who travel far. Following in the tradition of the regional conferences held annually by the Australian Bureau of Agricultural and Resource Economics and Sciences, the organic industry could host a regional roadshow in conjunction with its biennial conference. The roadshow could feature selected presentations and workshops from the national conference, as well as activities tailored to each location. There are a small number of regionally organised networks of organic producers. These networks play a valuable role in providing peer support to organic producers, as well as being a forum for the promotion of organic methods and the discussion of key industry issues. The peak body should consider how best to support these networks and to facilitate the creation of additional networks.